Marina (17) is a student of the Mitrovica Rock School and the front woman of mixed punk rock band Feed D Fury. She’s also talented writer and supports the Rock School with blogs about our activities. 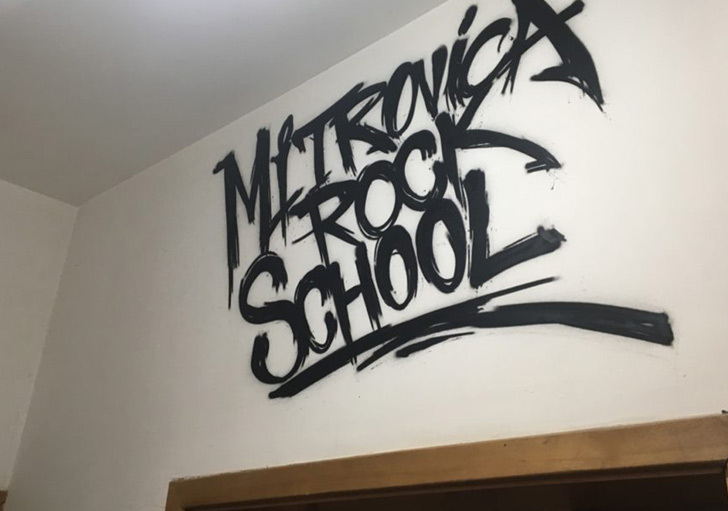 Each band from the North gave money, and together they gathered enough of it for an awesome graffiti of our infamous Mitrovica Rock School logo. All the work was done by a talented graffiti artist Endo, who clearly did an amazing job since all the students totally love this new hallway look. And when it comes to us, we’re certainly very thankful to have such lovely students and to have such a nice looking peace of artwork in our school. Our south branch hosts the offices of pioneering street art organization Futja Ngjyrë, who have used our school as their canvas since 2016.